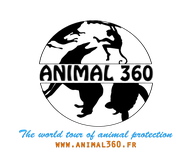 We created the non-profit association animal360.fr in july 2018, you can make a donation to support our projet and help the animal protection. donation via Paypal: connect to Paypal with this link and clik on Send money. Use our email contact@animal360.fr , then click on Send money to a friend, choose an amount, and confirm! Donation money is used for the operation of the association animal360.fr, for the travel expenses to carry out our reports, the costs related to the communication (payment of this site for example), expenses related to the interventions in schools, etc.